I have just been for the most beautiful bike ride around Richmond Park. I was within touching distance of lots of deer (definitely spotted Bambi in there somewhere) and I went wizzing past the Royal Ballet School which looks magnificent - I went about 5 miles in total. 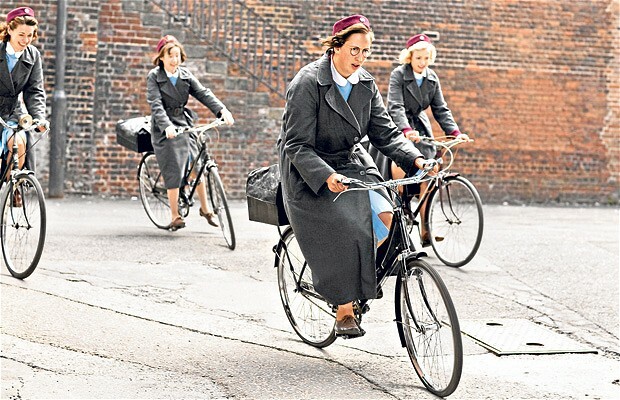 I probably looked a bit like my other hero Miranda Hart in Call the Midwife - slightly wobbly and off balance and most definitely also out of control! I very nearly fell off because an ambulance drove up behind me and put its siren on - which I thought was very mean! I enjoyed biking around - it reminded me of happy Oxford days when we biked everywhere. So nice to get out of university for just an hour. No sightings of Fenton - I am always on the look out!